Steve Tamayo draws upon his family history as a member of the Sicangu Lakota tribe. His fine arts education (BFA from Singe Gleska University), along with his cultural upbringing, have shaped him as an artist, historian, storyteller and dancer. Steve provides activities during his residencies that include art and regalia making, drumming, powwow dance demonstrations and lectures on the history, symbolism and meaning behind the Native customs and traditions. 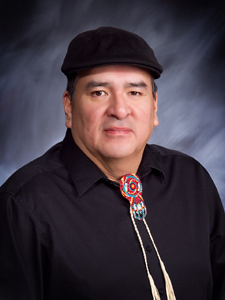 Steve has considerable experience developing curricula and teaching both youth and adults, including work with the Native American Advocacy Program of South Dakota, Omaha Public Schools, Minnesota Humanities Council and Metropolitan Community College of Omaha. He also leads groups of students and teachers on cultural excursions on the Rosebud reservation, introducing them to the rich culture and way of life that is slowly being revived among native communities. He is a past Governor’s Heritage Art Award recipient, an honor bestowed for his contributions in the arts and Native American culture.